After a very short night we took a seat at 7 am on the train to Kalaw. We´ve booked a ticket for the ordinary class to have more contact to the local people. And as we expected this day became a perfect one. Next to the locals we enjoyed the scenery on the outside and the conversations on the inside of the train. Everyone in our compartment tried to have a chat with us and the people shared their food with us. Everyone was so friendly. Next to us two old monks took a seat. Both between 60 and 70 and these guys where so funny. We had so much fun. Matthias once used his deodorant spray and they haven´t seen one before. So one of the monks asked him if he could try it as well. He was laughing out lound and screamed such because of the cold spray. Everyone in the compartment was laughing. 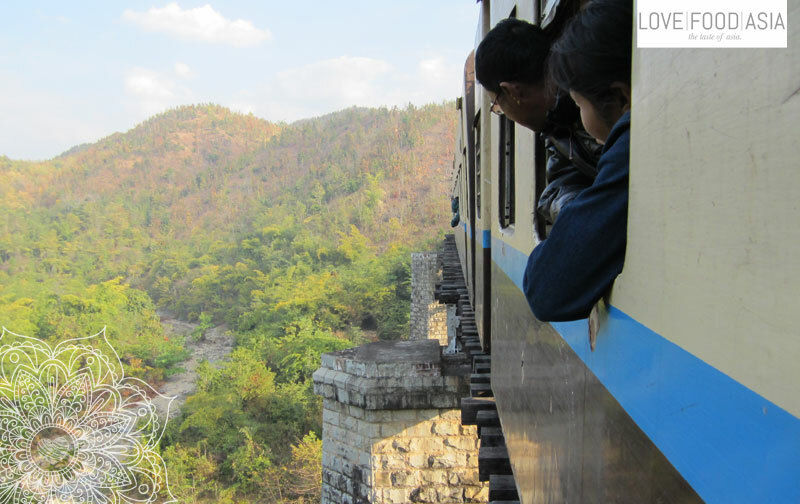 The train slowly drove up the serpentines and crossed some old bridges until we reached Kalaw after 6 long hours. Everyone in the compartment waved when we left the train. We walked around to find a guesthouse to have a short nap first. Kalaw is a small village where most of the trekking tours in direction Inle Lake are staring. There is not much to see and so we had a delicious Burmese noodle soup before we walked back to our guesthouse. On the opposite side of our guesthouse we heard the sound of a guitar and so we stopped to listen. Two guys where sitting next to an open fire and one of them was playing guitar and singing like a genius. We listened to old Burmese songs for at least 3 hours before we went to bed. An unforgettable moment. Listen to the guy singing in this video. Tomorrow we start a 3 days trekking tour in direction Inle Lake. We´ll need our warm clothes. The nights get cold in this area.